When I go out to my husbands garage to look for a tool they look all the same to me. Mostly black, silver, dirty and boring. One year for Christmas he got me my own tool box with a hammer, screw drivers, wrench, picture hanging stuff. All black, silver and Boring. (Shhhh….don’t tell him) They remained in the tool box inside but as the years went on and things were borrowed they went missing…probably in his garage among the black, silver, dirty and boring stuff. What would make being Mrs. Fix-It around the house fun??? How about fun, chic, woman size, tools in your own carry case??? Your very own PINK case? Your very own PINK case with PINK handles that lets your partner know that they are not his???? Dec.13- I voted for Simply Stacie on Picket Fence Blogs. I would like to try the family glue and stapler set. 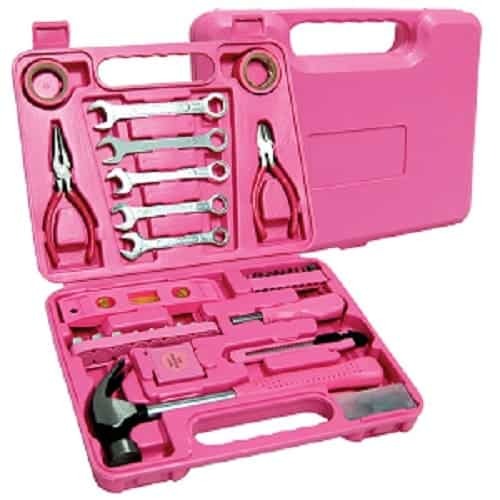 love the pink big momma tool box! You have just voted for Simply Stacie! I would love the Family Glue Gun and Stapler Set! I’m in the US. Like Ladies Tools Online on Facebook. Visited your Open Sky Store. My favorite product is the Savvycents Wallet. I’d love to try the cordless glue gun! That would be so nifty for my crafting! I am Following Simply Stacie on Networked Blogs. The Big Mamma set is cool.